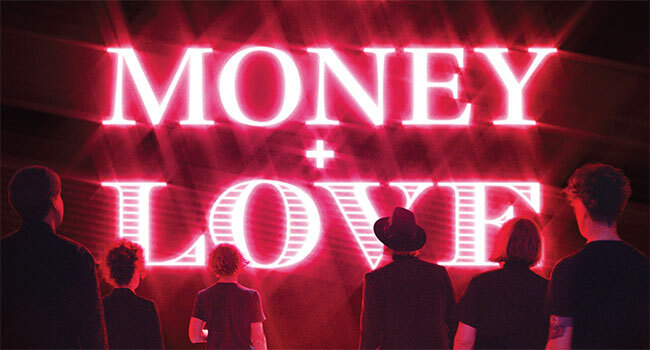 Money + Love, the 16-minute short film directed by David Wilson, written by David Wilson and Arcade Fire, and starring Arcade Fire and Toni Collette, can now be viewed in its entirety below. Money + Love chronicles the aftermath of Arcade Fire’s 360-degree deal with global media and e-commerce platform Everything Now, and features full performances of “Put Your Money on Me” and “We Don’t Deserve Love” from the GRAMMY-nominated global No. 1 album, Everything Now (Sonovox/Columbia). Arcade Fire played a surprise live set at a Money + Love premiere event last night (Wed, March 14th) at New York City’s Gramercy Theatre. The premiere featured a debut screening of the short film, preceded by a conversation between Spike Jonze and Arcade Fire and followed by a surprise Arcade Fire concert for an rapturous crowd of 600 ecstatic fans. The most intimate NYC Arcade Fire show in years, the show’s setlist featured such rarely played songs as “Headlights Look Like Diamonds” from the band’s self titled EP and “Antichrist Television Blues” from Neon Bible. Arcade Fire’s New York trip will continue through this weekend, with a March 17 appearance on Saturday Night Live with host Bill Hader. Arcade Fire has also confirmed the kick-off of the Everything Now Continued Tour, with six new U.S. headline shows, the band’s first confirmed no/n-festival headline appearances in the U.S. in 2018. Tickets to the new shows will be on sale to the public beginning Tuesday, March 20th.